Girl Scout cookie time is a happy time for my husband who looks forward to Thin Mints and Trefoils every year. Trefoils are the shortbread cookies. They are so basic, yet so buttery good. Since they are his favorites, and because we all love ice cream, I thought it would be fun to invent a fun dessert out of both, plus a couple other of our favorite ingredients. I love this treat, not only for its taste, but because it can be made in advance and is special enough for entertaining. You can also use this recipe as a framework, switching the ice cream flavors and/or cookie and nut combination. Vanilla or peanut butter swirl ice cream rolled in plain old chopped peanuts and drizzled with hot fudge is a favorite in our family. Or use Oreos on cookies and cream ice cream. Choose your favorites and create from there. When my older son tried this combination for the first time, he said proclaimed it to be one of his favorite all-time desserts! For me, this is actually a smart dessert because the pre-scooped balls ensure portion control! Scoop vanilla ice cream onto parchment paper-lined baking sheet and freeze until firm. Meanwhile, crush or finely chop cookies and cashews. I used my mini chopper (could also use a food processor) and kept the mixture a little chunky. Transfer crumbs to a pie plate or shallow bowl. When ice cream is firm, roll the balls in the crumb mixture, pressing to coat well, then return nut balls to freezer immediately. Repeat until all scoops are well coated and freeze until ready to eat. These will keep several days in your freezer; simply cover when completely frozen. Prior to eating, allow to sit on counter for five minutes or so to soften slightly. 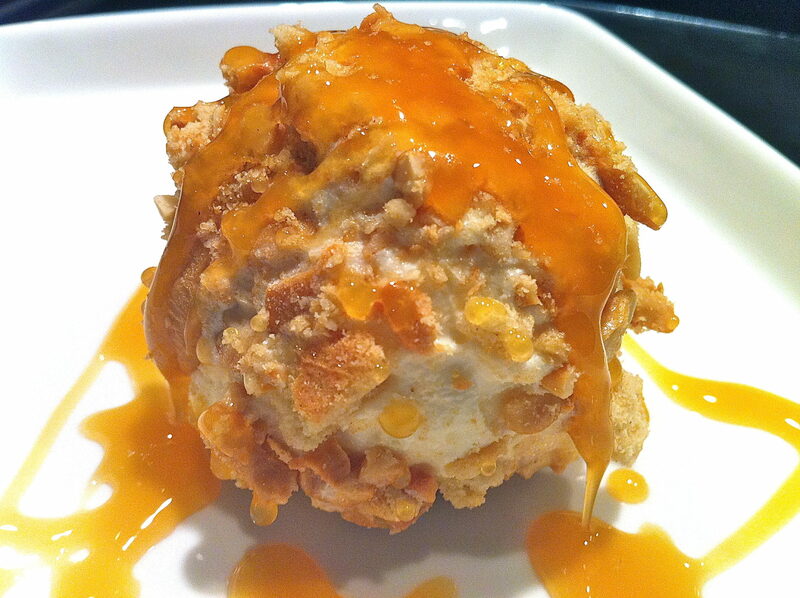 Top with butterscotch syrup and enjoy!